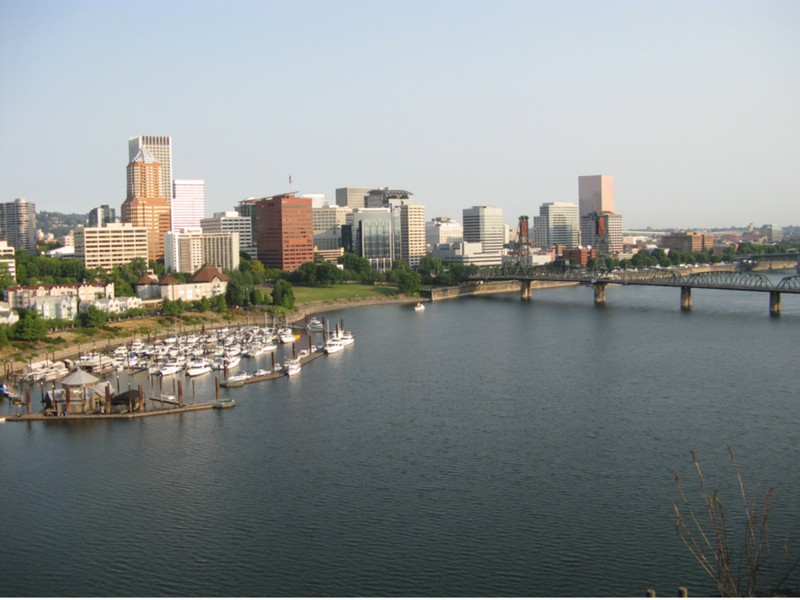 This adventure is a once a year opportunity to bike legally and safely on I-5 and I-405, to cross the Willamette River on the Marquam and Fremont freeway bridges, and to enjoy the other 8 Portland bridges without worrying about cars. 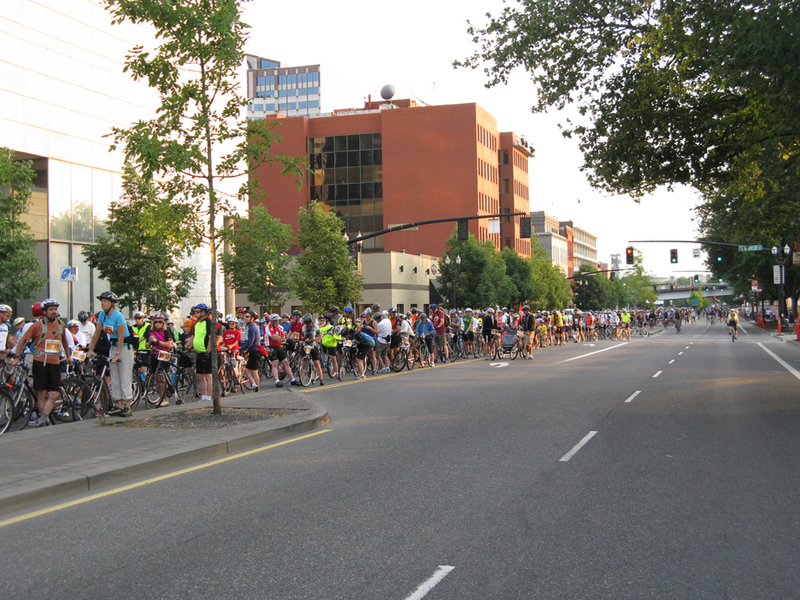 The annual August ride has now taken place for 17 years and since it’s very popular (some 18,000 bicyclists participated in 2012) it is likely to be repeated for many more years. 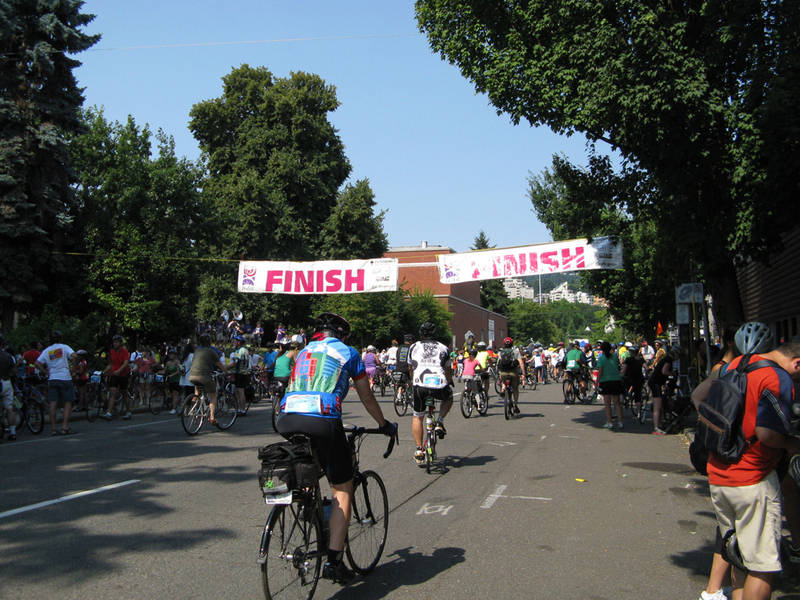 The ride benefits the Providence Heart and Vascular Institute as well as Intertwine Alliance partner The Bicycle Transportation Alliance (www.btaoregon.org). 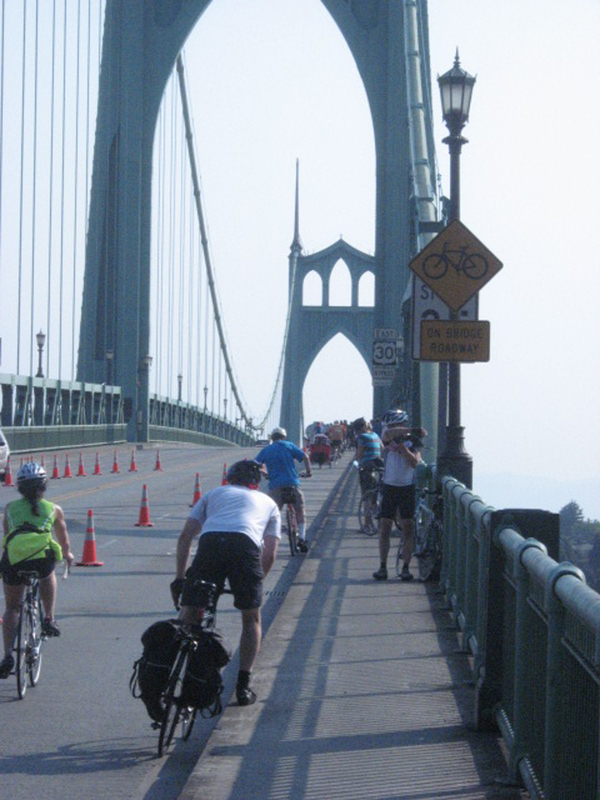 Died in the wool cyclists can challenge themselves with the 35 miles 10 bridges ride – that’s all of the famous Portland bridges – while more timid cyclists can tackle 8 bridges at a more leisurely pace over 24 miles. 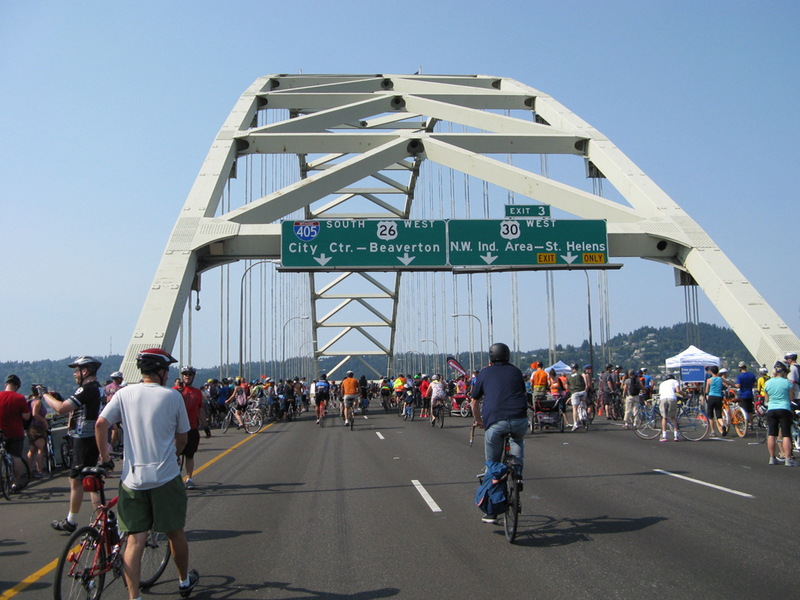 Many families enjoy the 13 miles 6 bridges ride in the Portland downtown area. 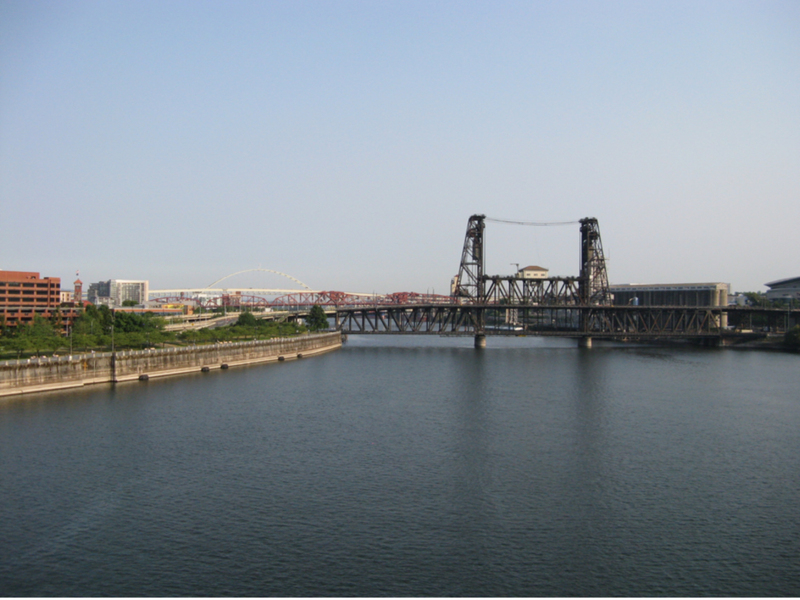 Last, but not least, the Bridge Stride offers 6 miles of walking across the Freemont and Broadway bridges. 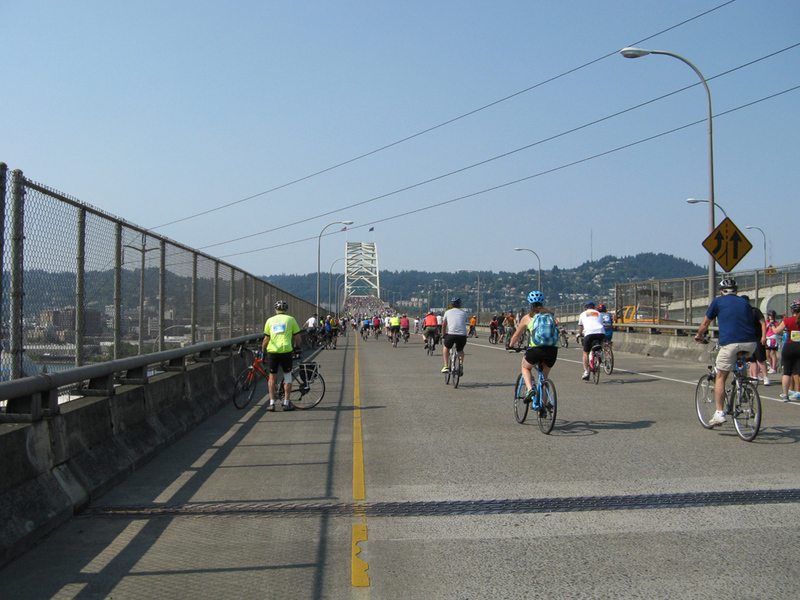 For most cyclists the ride is about having fun and spending a day with friends and family, enjoying the city, the bridges and the streets. Racing with others or trying to break a personal record is not recommended. 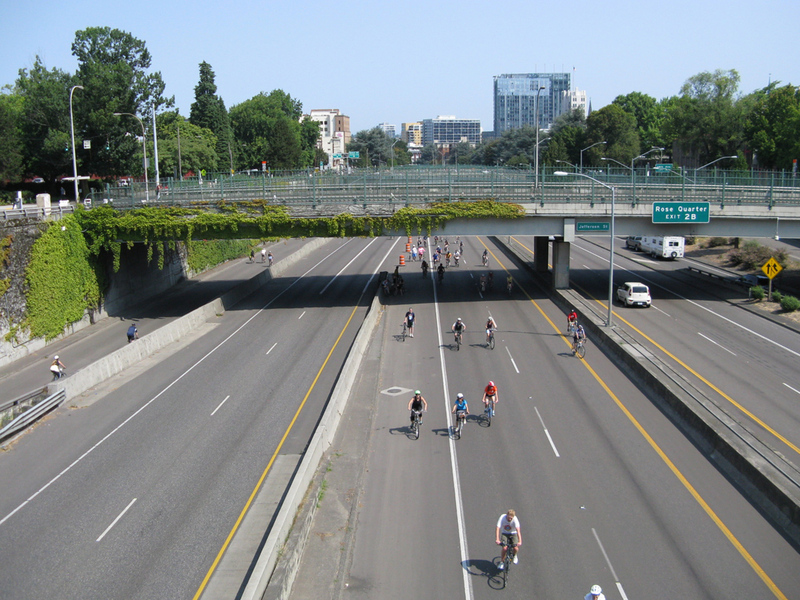 While the routes are car-free, they are not free from congestion! 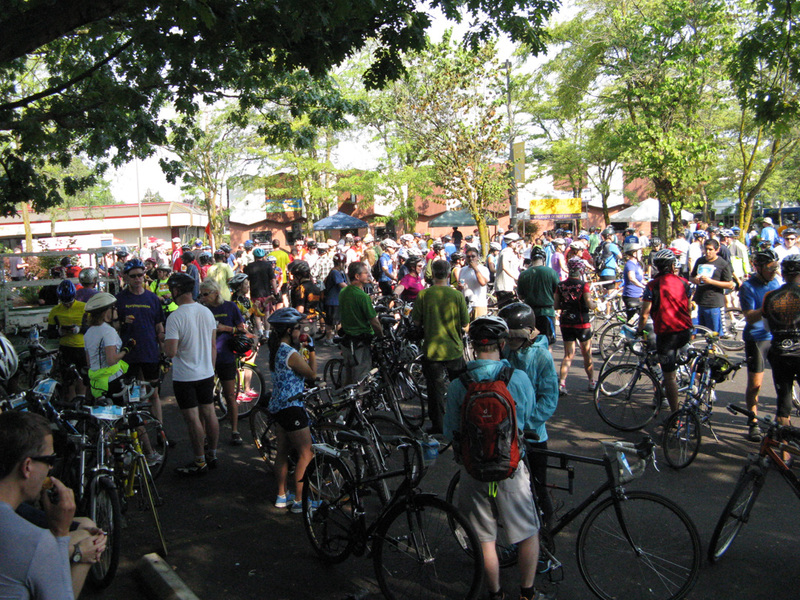 Often the riders move in tight groups, especially in bottlenecks or after being stopped at a closed railroad crossing. 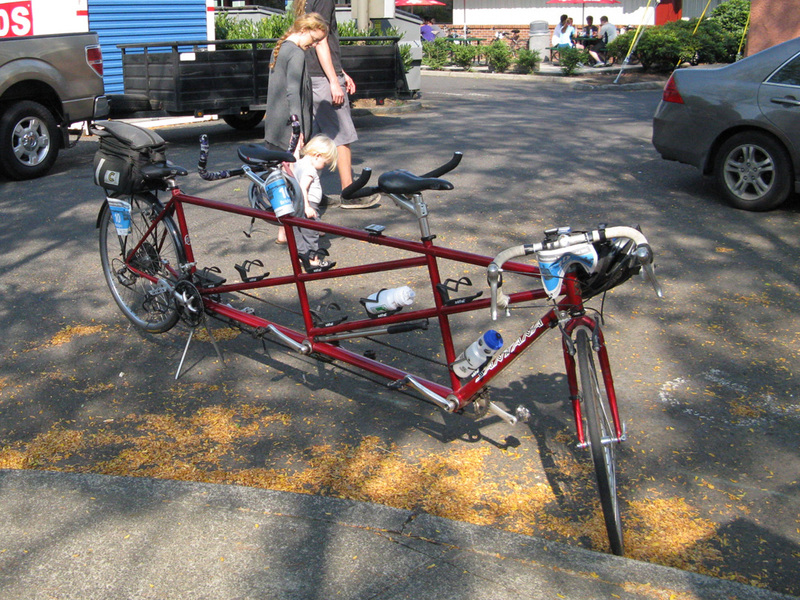 Constant attention to fellow riders and caution are required. 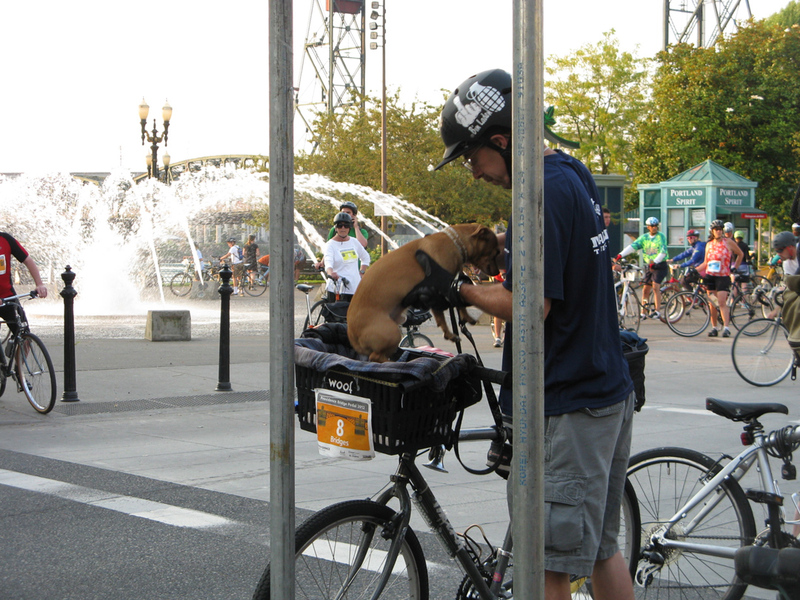 Portable toilets are located along the routes, and a couple of rest stops offer nutritious snacks as well as an opportunity to refill water bottles. Entrepreneurial kids living on the route set up lemonade stands and in north Portland a woman played the violin in her front yard – to the delight and amusement of the riders. 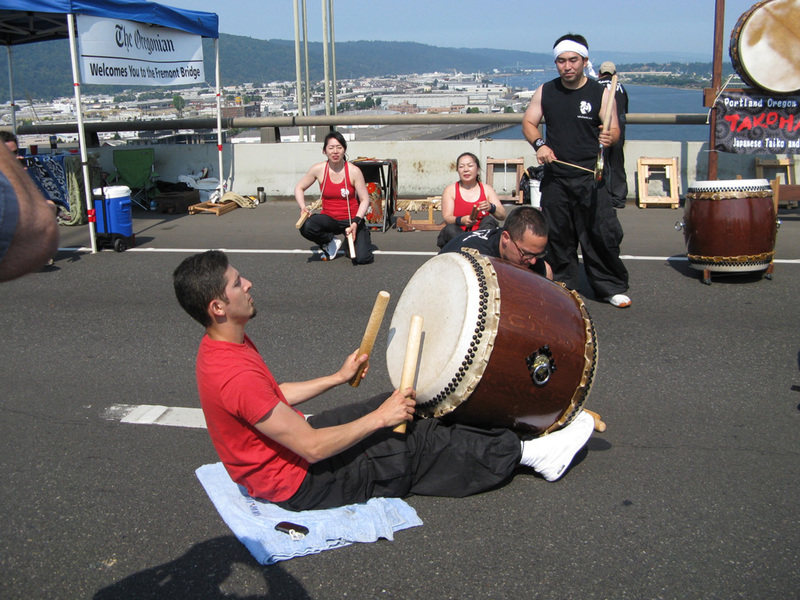 Music further heightened the spirits on the Marquam bridge, a band almost made us kick up our heels on the east side of the St. John’s bridge, and Japanese drummers set the beat for the last stretch to the finish line. There the riders were greeted by the One More Time Around Marching Band, performing in front of Lincoln High School.